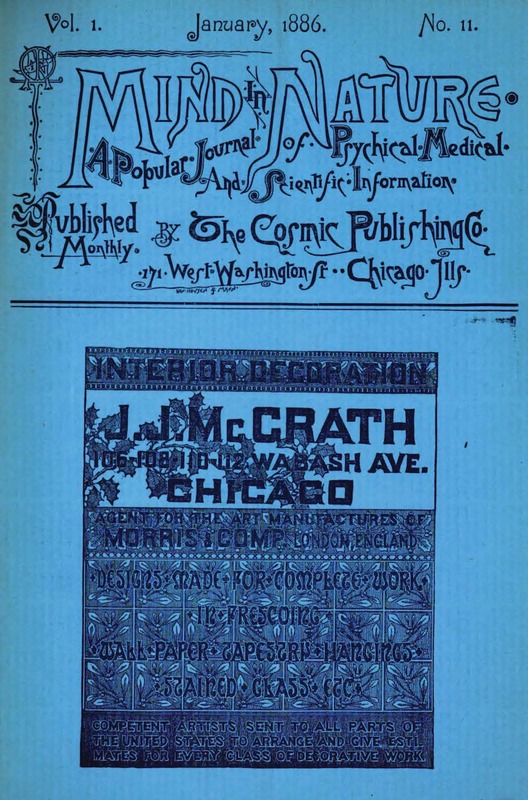 A Popular Journal of Psychical, Medical and Scientific Information. Chicago, IL. Publisher: Cosmic Publishing Company. Editor: J.E. Woodhead. 1/1, March 1885-1887. 16 pp., $1.00 a year. This was a very highbrow journal whose contributors seemed equally divided among bishops, physicians and professors-including Elliott Coues and Oliver Lodge. It proclaimed its purpose as "to furnish, in a popular manner, information regarding psychical questions, the relations of mind to the body and their reciprocal action, with special bearings on disease and health, and to give the most striking and interesting facts and discoveries of science." Telepathy was said to be a special interest. The affinity of its subject matter with Christian Science was obvious and the journal attracted advertisements by Mrs. U.N. Gestefeld ("Teacher and Practitioner of Metaphysics") and several students of Mary Baker Eddy's, as well as advertisements for S.C. Gould's Notes and Queries, the revived Journal du Magnétisme, and Caroline B. Winslow's Alpha. Crabtree 1117. LOC; Columbia University; NY Academy of Medicine; NY State Library; Los Angeles Public Library; University of California, Davis; Harvard University; and other locations in OCLC.